De Nieuwe Compagnie van Verre, the N.C.V., was founded on the 8th of Februari 1947, one year after the foundation of het Nederlands Opleidings Instituut voor het Buitenland, het N.O.I.B. The N.O.I.B. 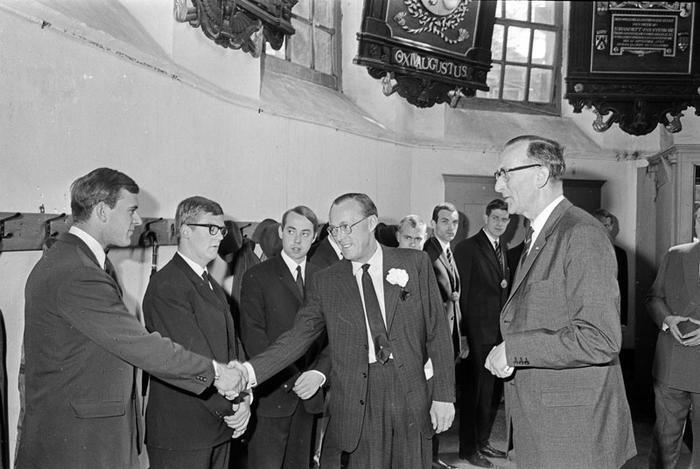 was tailored towards preparing young and talented Dutch men for a career abroad, with the ultimate goal of furthering the economy of the Netherlands. The foundation of the N.C.V., in 1947, was in collaboration with our honorably member and patron ZKH Prins Bernhard von Lippe-Biesterfeld. Since then a lot has changed at Nyenrode. Women were first allowed on campus in 1972, and the study program changed from BBA, to IDP and to MSc. In 2016 the Bachelor program returned to Nyenrode, allowing for young students to get their bachelor's degree after a 3 year program.